The free event, hosted by Dig Safely New York, is taking place on Wed., March 14th, from 7:00 a.m. to 2:15 p.m., at the Rockland Community College Fieldhouse in Suffern, NY. 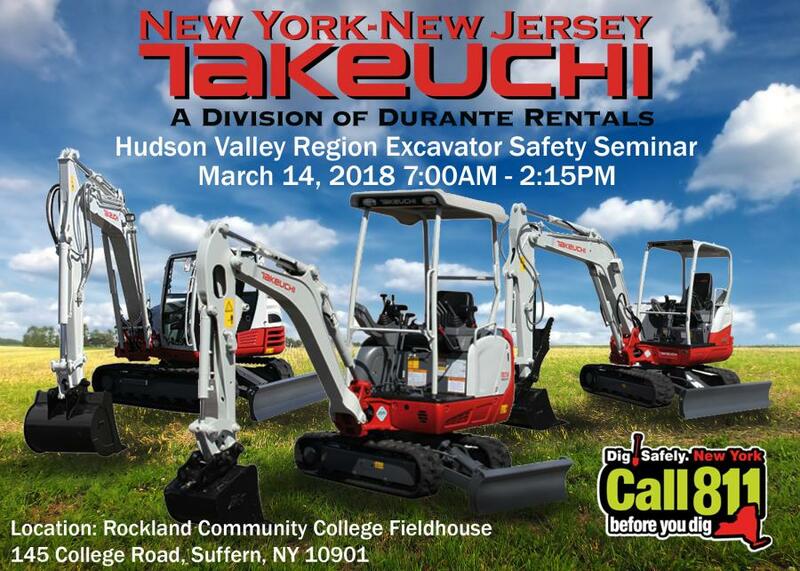 Durante Rentals and their earth-moving division, New York – New Jersey Takeuchi, are sponsoring this year's Hudson Valley Region Excavator Safety Seminar. The free event, hosted by Dig Safely New York, is taking place on Wed., March 14th, from 7:00 a.m. to 2:15 p.m., at the Rockland Community College Fieldhouse in Suffern, NY. Along with sponsoring the event, Durante Rentals and NY-NJ Takeuchi will have their Takeuchi mini excavators on full display at the show entrance where attendees are encouraged to take an up-close look at these machines. You can stop by their booth for machine catalogs, promo items, and giveaways. Industry veteran and V.P. of Takeuchi Sales at Durante, Chris Hamblet, will be on hand to answer questions. “This will be our second year at the show and if you own or operate excavators, you need to be here”, said Chris Hamblet. “The safety lessons you'll take away from this event are invaluable, helping prevent injuries and save lives,” said Chris. This is Dig Safely New York's 12th consecutive year hosting NY State's Premier Underground Damage Prevention Safety Training Series. Last year's seminar series drew over 3,300 attendees, including municipalities, utility personnel, safety professionals, and other excavator operators. The Excavator Safety Seminars offer free training sessions that qualify as a certified excavator renewal event. This year's agenda includes a keynote by Brandon Schroeder, a catered lunch, a Who Wants to be an Excavator audience participation game, and a vendor-wide raffle at the conclusion of the show with great prizes, including a pair of Mets tickets donated by Durante Rentals and NY-NJ Takeuchi. Founded in 2009 by three entrepreneurs, Durante Rentals is the most dependable name in construction equipment rentals with locations in the Bronx, Brooklyn, Brewster, Carmel, Elmsford, Flushing, Mt. Vernon, West Nyack, Danbury, and New Jersey coming soon. Contractors look to Durante for all their construction equipment needs including telehandlers, scissor lifts, generators, boom lifts, conveyors, track loaders, skid steers, ride-on rollers, forklifts and more. Durante Rentals services all five boroughs of NYC, Westchester, Rockland County, Putnam County, Connecticut and New Jersey. For more information about Durante Rentals, visit www.DuranteRentals.com or call 1-800-DURANTE. Westchester, Putnam and Rockland County areas. They specialize in sales, rentals, service and parts for the full Takeuchi fleet of earth- moving machines including track loaders, wheel loaders, skid steers, and mini excavators. New York – New Jersey Takeuchi is a division of Durante Rentals. For more information, visit or call 1-800-DURANTE.